Musa Abdul-Aleem’s trials may not appear obvious to the untrained eye. After all, how tough can things be for a 6-5, 220-pound Division I college basketball player living among the beaches and palm trees of Tampa, Florida? Such an existence sounds like a young man’s paradise to those chasing the rewards of the dunya, but for Abdul-Aleem, it is nothing more than a test of faith. The junior shooting guard at the University of South Florida is a devout Muslim, one-half of a twin-brother tandem whose other half plays for a college 250 miles up the road in Tallahassee. 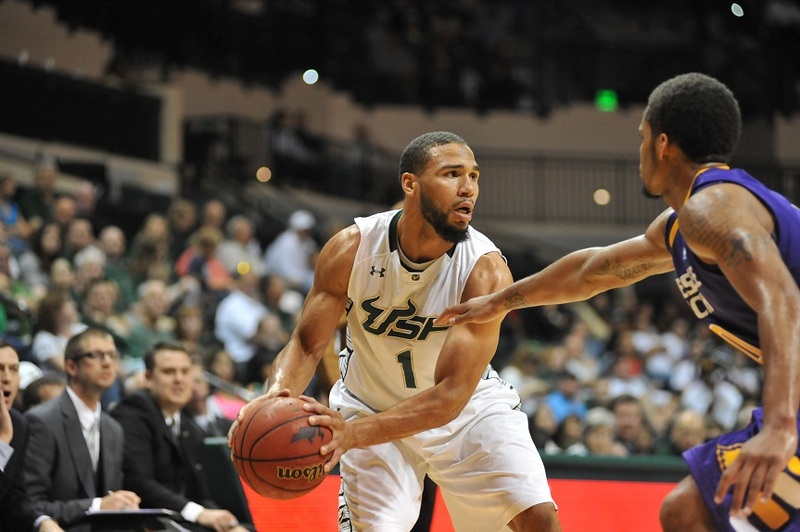 At press time, Abdul-Aleem was averaging 4.1 points per game for the Bulls going into the American Athletic Conference tournament, scoring in double figures in games against Bethune-Cookman and Temple, and contributing off the bench against powerhouse programs like UConn, Memphis and Oklahoma State. UMMAH SPORTS: What do you bring to the table for a basketball team? MUSA ABDUL-ALEEM: I’m a shooting guard. I love to shoot the three. That’s my biggest weapon. I love to bring energy, bring enthusiasm and motivate my teammates. I’m athletic, so I can get to the rim; I like to use ball-fakes to get to where I’m going. I like to take mid-range jump shots. But most of my game — this year in particular — is shooting threes, like Ray Allen and Reggie Miller. That’s what we need on the team this year, and whatever my coach needs me to do, that’s what I do. I can always work on my motor defensively. I can always work on making my teammates better, making the extra play or the extra pass. A lot of times I see a shot that I think I can’t miss, so I’ll take a shot that may not have been the best play for the team. I’m just used to making those shots, but on this level you have talented enough guys on your team where you don’t need to do that and take every shot. As soon as I could walk. As soon as I had the strength to pick up a basketball. My father put a basketball in our hands as soon as we could lift one. No, basketball was it. We almost ventured off into boxing; our grandfather was a professional boxer and my dad was a boxing trainer. We gave some thought to football just because of how big and strong we were at young age, but it’s always been basketball. You and your brother (Muhammad Abdul-Aleem is a senior guard at Florida A&M) were home-schooled. How does that work as far as being able to play high school sports? There are a few states in America that allow home-schooled students to play sports and do extra-curricular activities at any school. Florida was the closest state like that to Georgia, which is where we grew up, and Georgia did not allow that. We tried to appeal the law in Georgia, but we eventually moved to Florida so we could be home-schooled and use the facilities at other high schools. I played for four different high schools. I played for King High School my freshman year, West Oak Academy my sophomore year, Brevard Christian my junior year. My senior year I played at W.D. Mohammed High School in Atlanta; they’ve since changed their name. Is the W.D. Mohammed school affiliated with the Nation of Islam? I believe the school devised from the Nation of Islam. They’re very involved in that community and started the school. Was your home-schooling like going to an Islamic school? For the most part, it was like going to regular school. We had one class, our first class of the day, that was an Islamic Studies class. That’s what really changed everything for me. I learned a lot in that class, and I never would have gotten that going to a public school or a private school. I wouldn’t have had the advantage of learning about Islam in an Islamic environment. My stepmom, she was already a teacher and a principal, and when she married my father they decided to home-school us. She brought in other students and made it into a whole school, an Islamic institute for young Muslim kids. One sister that we went to school with, she still has the record for the highest GPA in bio-medicine at Spellman College. All of her sisters were in our program, and they’re all extremely intelligent young ladies. When did you start getting attention from college recruiters for basketball? Between my freshman and sophomore years, I started getting some notoriety. Eventually there were about 20 of the top Division-I schools that were recruiting me. USF was at the bottom of that list at first. It was an amazing experience, getting calls from some of the top coaches in the country offering me scholarships. How did USF end up at the top of the list? A lot of reasons. They were in the Big East at the time, my Dad lives an hour away from campus, they were an up-and-coming program. (Head coach) Stan Heath had just won Coach of the Year. USF was a school on the rise, so I was really excited about being part of that. I’m grateful for the opportunity to play and experience D-I basketball at its finest level. It’s been challenging, but I’m grateful for the good things that I’ve gone through. When you and your twin brother went your separate ways for college, was that your first time being apart from each other? Yes, and it wasn’t easy, but that’s what we had to do. We adjusted pretty quickly, but I definitely wasn’t used to it because we’re extremely close. Was having a brother you’re so close to helpful just as a young Muslim growing up and staying focused on your deen? Absolutely. Allah knows best, but we’ve talked about playing together again, maybe in a Muslim country. You don’t know what will happen, but we’ve always talked about that. When has your deen been challenged? Being on a college campus and the lifestyle that brings, there was a time when I was afraid for myself. The music, the women, people smoking and drinking. As Muslims, there are a lot of things we have to safeguard ourselves from. There are a lot of temptations that we know as Muslims we can’t participate in. That college campus lifestyle, that’s not the lifestyle I’d choose for myself or my family. But it’s a choice to be here. It’s not a necessity. You can be successful in life without going to college. It’s more difficult, but you can do it. So I chose to be here and, Alhamdulillah, I’m handling it well and making the best of it. Every Muslim athlete gets this question, but how do you make it through Ramadan when you have to fast during the day but still have to train? Are there other times when Islam and basketball conflict and you have to make a choice? I never have to make a choice. I made it clear to all the coaches that recruited me: Islam is first. Whatever I have to do religiously, I’m going to do it. Whether that’s Eid, Ramadan, Jummah … if it conflicts with a game or practice, there’s nothing I can do. Did religion ever become an issue while you were being recruited? Did any schools back off or have an issue with your commitment to Islam? Not at all. These schools were recruiting me very hard. In fact, the longer I went before I signed, more schools were calling. None of them ever cared about my religious beliefs. Did you get recruited by any religious institutions? I know Gonzaga and Georgetown are Jesuit schools; they recruited me. Other than that, I didn’t remember how many schools were Christian or Catholic schools. You mentioned playing pro basketball. What do you see yourself doing after basketball? I’m really not sure yet, man. I don’t mind sticking with athletics, maybe doing physical training. I love sports and love to be around sports. So maybe something with coaching or training. What kind of interactions have you had with teammates regarding Islam? Do you they ask you questions? They ask me questions all the time, mostly about things that I can or can’t do, what I can and can’t eat. If I can answer it, I will, and hopefully they’ll learn something about Islam. But yeah, I get a lot of questions. That’s been going on since I’ve been around the sport. Have you had any negative interactions with teammates or coaches regarding Islam? I’d say more challenging than negative. Sometimes you speak with people who are very strong in their religion and it can be a challenge to talk to them without there being an outburst or without getting into comparative religion. I don’t really like to debate, so I’d rather not speak about it than get into an argument. You can ask me about my religion, and I can ask you about yours, but let’s keep it at that level. What lessons has Islam taught you that you’ve carried over to basketball? I think just overall respect and honesty. And that can be a good thing or a bad thing because sometimes people try to take advantage of that. But there are different types of people wherever you go; some will like you and some won’t. The prophets were the best human beings that ever walked the face of the Earth, and they were mistreated. They were called liars and madmen and soothsayers. They were called all kinds of names. So who are we? These pious, righteous men who never lied, never committed a major sin, if they were treated like that, what should we expect? I have faith in Allah that allows me to continue to move forward. I can’t allow my environment to change me, because I can’t change my environment.